Sigrun Davidsdóttir´s second Beck lecture was on the combining of her role as an international journalist and a fiction writer. Along with her career as a journalist, writing for Icelandic radio but also for major international publications, she has also written novels and children´s stories, her latest novel being Samhengi hlutana. This is a combination in which I, personally, am interested. There are historic precedents, for example, Hemingway was both journalist and fiction writer. Stephen Crane (The Red Badge of Courage) worked as a reporter. Mark Twaine worked as a journalist. So, even though the two worlds of journalism and creative writing seem quite separated, the one built of facts, the other of imagination, those two worlds have quite successfully come together many times, in many ways. I have never been able to see this great gjá that separates the two. It is true that there are reporters, journalists who lack imagination and equally true that there are fiction writers who are too lazy to research their facts. But that is a failing of individuals, not of a failing of the professions. Sigrun, like all Icelanders, even though she h as lived abroad since 1988, has been affected by the kreppa, the economic crises or crash of 2008. Because she was reporting on the crash and its effects on people, she built up a store of knowledge. From that, she wanted to create a novel because a novel can tell the story that, at this stage, may not yet appear in the newspaper. 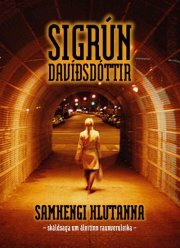 This most recent novel, Samhengi hlutana, takes place in London and Reykjavik during the years 2002-2010. She says she was inspired by a variety of writers. Leif Davidsen is one of those. He‘s a Danish author, educated as a journalist, he worked as a freelance journalist, began covering news from Russia for Danmarks Radio. He was stationed in Moscow. Since returning to Denmark, he‘s been writing political thrillers. John Grisham, of course is well known. He learned his material working as a lawyer and turned that knowledge into novels like The Firm. Chris Morgan Jones wrote An Agent of Deceit. The author worked at a business intellience agency for eleven years advising Russian oligarchs and he uses the material he‘s learned to create a thriller. All of these novelists, although they helped move her toward writing a novel about the Kreppa, were unsatisfactory. Their short comings were that the reader doesn‘t get to know the financial information, the tax evasion schemes are never completely explained. She wanted her readers to know what happened in Iceland. If anyone was a direct influence it would be Peter Hoeg‘s novel Smilla‘s Sense of Snow. In Writing Into Reality, she wants a credible story, a world the reader can step into and believe. She wants a balance of reality and fiction. Reality can‘t get in the way of the story but the facts still have to be right. If the story is well told, it shouldn‘t matter from where the readers come from. This is a good attitude because, today, with ebooks and international publishing readers may be in Japan, India, Russia and any number of other countries. Like all authors, she wants her book to be a page turner. She wants the reader get to the last page. The thriller often has a set structure/plot but Sigurn didn‘t want her book categorized as a thriller. She was going to write a novel set in Venice in the 18th C. Instead, 2008 happened. The result was a book set in the present, a book in which she wants to take the reader through the mental landscape of the crash. It isn‘t just the financial manipulation that matters but the way of thinking by the participants. That, the desire to create the psychological and moral (or immoral) landscape of the people who created the crash, was the most interesting element she mentioned. In a way, she is following in the footsteps of Stephen Crane in The Red Badge of Courage where he describes the inner world of a young soldier. The focus is on the mind of the character. Sigrun repeated many times that economic crashes are not acts of nature. They are created by people. In many cases, a small group of people. In Iceland, the crash may have been created by as few as fifty people but then there were all the others who went along with what was happening or, who refused to see the evidence in front of them, of what was happening. The crash occurred because of choices some people made. Who wanted the banks privatized? Who worked together to get it done? Who set up a system of loans without collateral? Nature didn‘t do it. Some people did it? What were they like, how did they think, what were their morals, motives? Let‘s hope that Samhengi hlutan, Not A Single Word, gets published in English.